Fast and reliable carbon neutral web hosting perfect for your website and email. Includes Let's Encrypt free SSL, IPv6, powerful Wordpress tools, and hundreds of one click install applications, plus free migration if needed. There's a range of packages to suit every need and budget. Expand the table to find out every last little detail. Keep reading to hear about some of the great features of our hosting. Our web hosting uses Plesk for Linux which we find is perfect for almost every website and is easier to use. That said, if you prefer cPanel or your website requires Windows web technology then we can do that too. 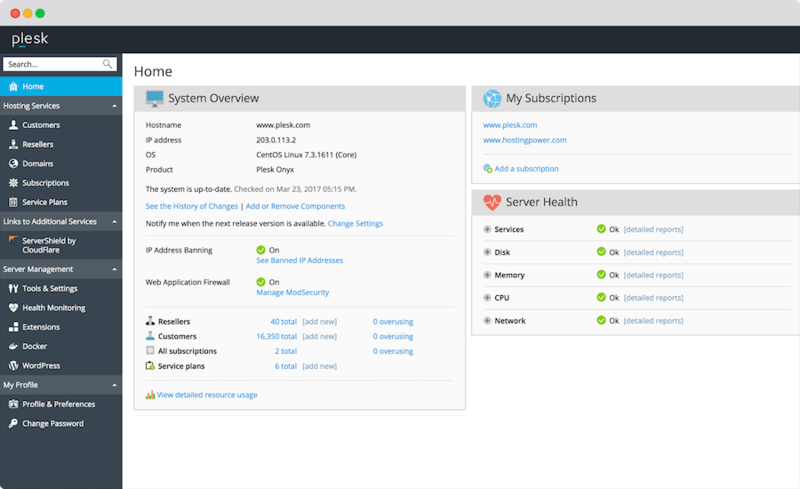 Plesk control panel provides a single intuitive interface to manage every aspect of your hosting from email addresses, to spam filtering, to FTP, and databases. Secure your website with SSL/TLS encryption for FREE with just a click of the mouse with Let's Encrypt support. Native IPv6 support is enabled by default on all shared hosting, each account gets a dedicated IPv6 address and a shared IPv4 address. Quickly and easily install Wordpress with a single button, then manage updates, security, and plugins in one control panel. Deploy applications written in Ruby and Node.js with your choice of version and support for frameworks like Rails, plus dependencies will be automatically managed. You can also manage your code versioning with built in support for Git.